Is it really Friday night already? This week sure did fly by! I had a simple but wonderful spring break. I had lots of down time to rest and do nothing but I also had a little fun and did some more cleaning out and reorganizing too. I have just been in the mood to clean, sort, purge, and reorganize this year. I have always been organized, but this year I have been getting rid of a lot more stuff than I normally do. I cleaned out my bathroom closet and vanity today and got rid of a bunch of junk! It amazes me that I still had bottles of nail polish that haven't been opened in over 10 years! What was I thinking? LOL! Anywho, let me share a few pictures from my week. On Tuesday, I had to run to the grocery store to pick up a few things since I hadn't left the house in 3 days! While I was out and about, I ran into one of my favorite thrift stores. You know I have been trying to stay out of thrift stores most of the time, but I still enjoy going every now and then and looking for things that I actually need or will use. This trip was a good one. I didn't find much, but I did pick up a few kitchen utensils for a steal! The pastry wheel, melon baller, and knives were around $0.50 each and the silver spoons were $0.29 each. 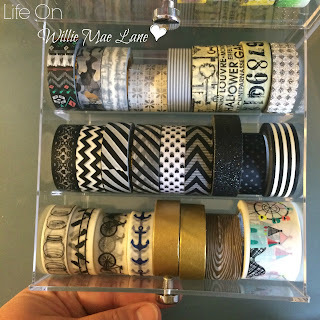 They went in my craft room stash. The adorable little pinwheel gift tags were new in the package for $0.29. The glass jar was $0.99. I was so excited to find this jar. Let me show you why. It's a mini version of a jar (actually two) that I have had for about 25 years. One of them holds marbles and this one holds our loose change. I put the small one beside it and separated the silver coins from the pennies. When they get full, we will cash them in. I just love this cute little jar! I also picked up a like new pair of pants for work for $3.99. When I was paying the cashier told me clothes were buy one get one free that day, so I went back and picked up the top I had debated on getting . It's really pretty and will also be good for work. On my way home I had to run by Mama's house and drop off a can of peas I had picked up for her. She showed me this little cutie. Do you know what it is? If you guessed pineapple, you are correct. It is a baby...their first one! I also looked at her lilies. They are sprouting out and will be gorgeous soon! Look at the size of those bulbs! On Wednesday, I picked up a couple work friends and we met another work friend in Cedar Key. We spent a couple hours on the little beach and watched the pelicans, seagulls, a crab and dolphins. I enjoyed watching my co-workers' kids playing on the beach too. It was overcast but they had a blast anyway. It was a nice, relaxing day. We saw a seagull with just one foot. Poor thing...but he didn't seem phased by it! After we left the beach, we had lunch. One of my co-workers and I shared some crab stuffed mushrooms. Yum! I ordered shrimp tacos and sweet potato fries. Talk about delicious! We walked a bit and checked out a couple shops and then rode around town before heading home. I snapped a quick picture of their school. I love the stained glass shark window above the doors. Cedar Key is a lovely little town and one I love to visit from time to time. Thursday I stayed home during the day and then went to watch my nephew's lacrosse game that evening. Friday I stayed home during the day again and hung out with the pupsters! I love how they both go to the top step and scope things out before going down. So funny! They do this almost every time they go out. They are quite fond of each other now and Rooster is like Sadie's little shadow. Friday evening, the hubby and I went to buy groceries and pick up a few things we needed. 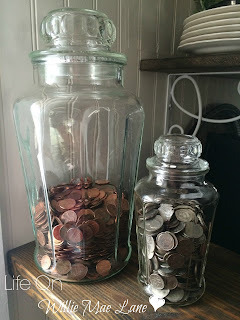 When we got home, I put everything away and sat down to write this post. Nothing overly exciting about my week but it was just what I needed. Tomorrow I have a baby shower and then I'm going to my classroom to do a few things to prepare for next week. It promises to be a busy one with parent conferences, lunch duty, and an Easter party on Friday! The more I can get done ahead of time, the smoother the week will go. I hope you all had a delightful week and may your weekend be just what you want it to be. Hope this finds you doing well. I am really enjoying my spring break. Today I spent the day with some work friends at a small beach not too far from home. I may share some pictures soon. I've been working in my happy place again (actually most of this has been done for a few weeks) and have moved some things around and reorganized some things. Want to see what I've been up to? Come on in! We'll begin to the left as you walk in the door. I really didn't do much of anything here except change out some of the things on top of the white cabinet. Lots of random junk stuff! The big change I made was moving my two white shelves. These used to be in a corner in an "L" shaped configuration. I had to move them out of the corner for the hubby to access the panel for the guest bathroom shower during the redo, so I decided to move them across the room. My sewing machine cabinet and file cabinet used to be on this wall. Here are the two shelves side by side. I eventually want to replace these with an Ikea Expedit shelf system. These shelves are over 20 years old and were super inexpensive. They are still in decent shape but they definitely need to be replaced. These shelves got reorganized in the move. I used several baskets and bins that I moved from various places in the house to store stuff in. It looks a bit less cluttered this way. I labeled the bins to make it easier to find what I am looking for as well. The striped bins used to house my DVD collection but I am about to redo my system for organizing them so I no longer needed these bins. 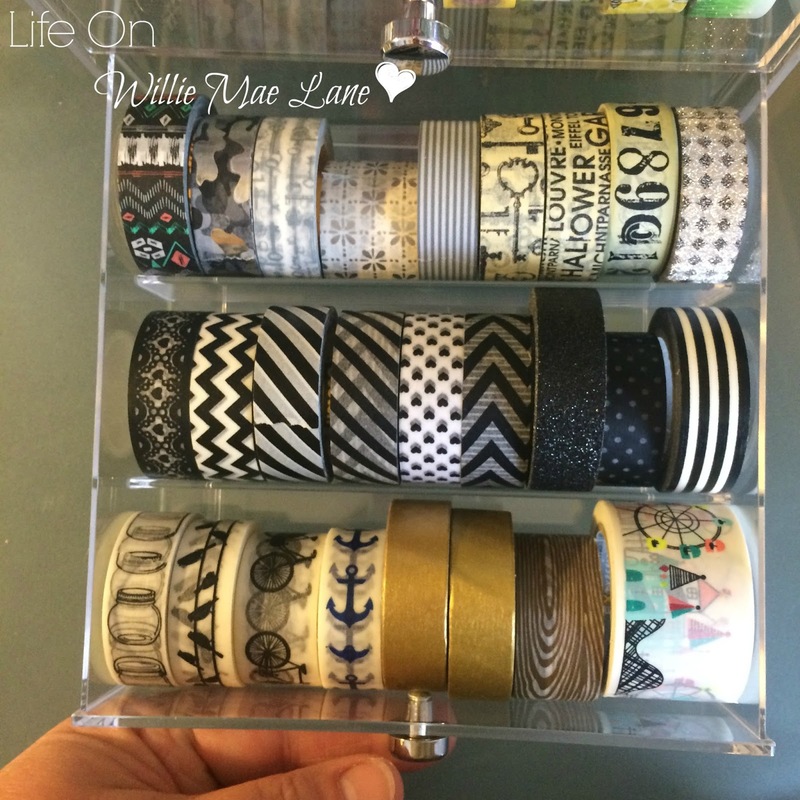 I am still liking my gift wrap organization station I put together a few months ago. Moving on, this is one of the shelves that hold the glass top that is my desk. And here is the desk. I took the two small while vertical shelves and turned them on their sides and placed them on my desk. I really like this system. I was watching HGTV on this day....House Hunters I believe. 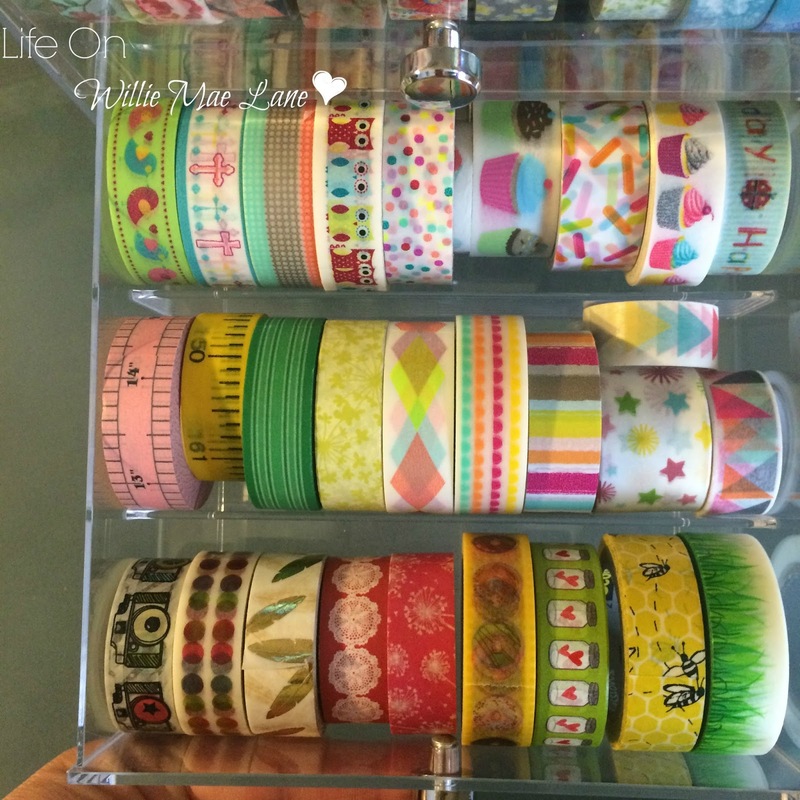 I am loving my new washi tape holder I ordered from Amazon. It is designed to hold eyeglasses. 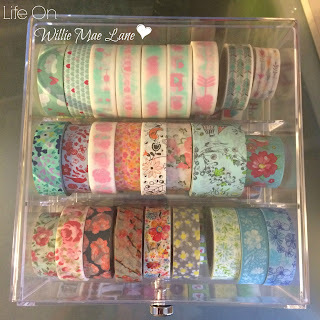 but it is perfect for washi because of the dividers inside each tray that prevent the rolls from moving back and forth. It is perfection! And...it's so pretty! 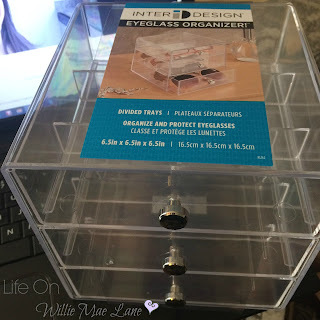 I am loving clear storage lately. Each drawer holds approximately 27 rolls. I couldn't fit all my washi in this unit but it held the majority of it. 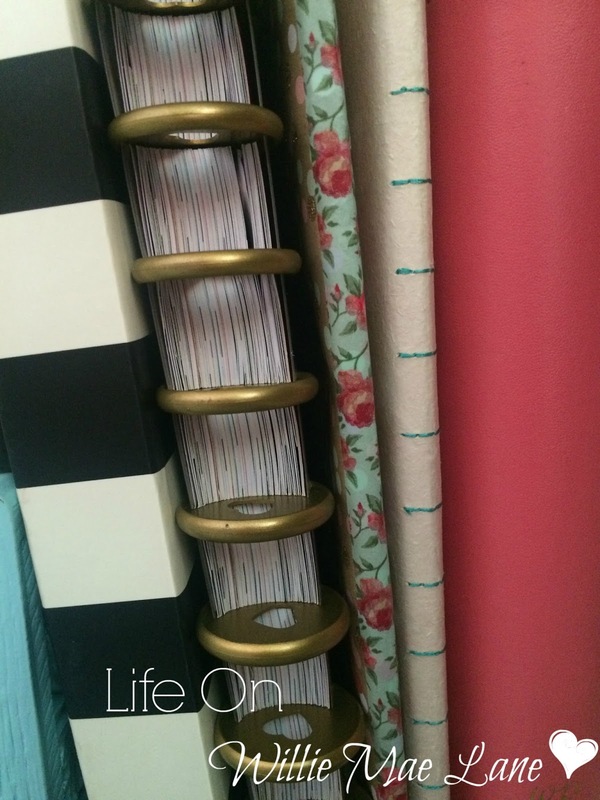 I love the spines of my planners and notebooks in this picture. So pretty! This is another favorite on my desk. I wanted to redo my filing system and keep files to a minimum and in sight instead of in my file cabinet. I find if I keep things out where I can see them and easily get to them I am more likely to use them. I was terrible about letting things pile up before I would file them, but since I started this system I haven't done that. 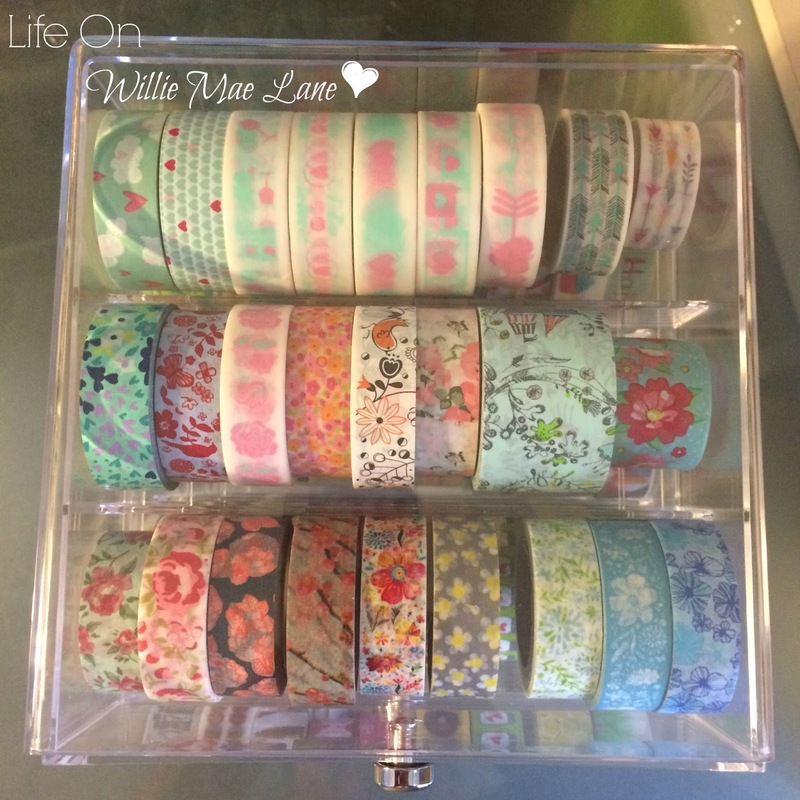 Remember I said I am loving clear storage lately. Well, I wanted an acrylic file box so I could see my pretty file folders that I have picked up over the past year or so at TJ Maxx. I really didn't want to pay the price for one on Amazon and I remembered I had purchased this acrylic beverage dispenser for a couple bucks a few months ago. It was still under my kitchen sink, so I got it out and would you believe it is the perfect size for my file folders! It has handles on the sides. And here is where the spout used to be. I kept it in case I ever change my mind and want to use this for a drink dispenser again, although I'm really doubting I will. I love how pretty it is and functional too! I can switch out the folder in the front and have a new piece of "art" to look at when I feel like it. OK...moving on around to the window end of the room. I My 2016 Katie Daisy calendar is a favorite right now as well. I just love her style! I put a different curtain up. This is the one I made when I first took over this room as a craft room. My small blue ladder sits beneath and holds a few pretties as well as some jars for storage. Two of them are empty! My paper shredder sits to the right of the ladder. I am not loving this setup but it will do for now. I would like to put the drawer cube in the middle and the two metal card catalogs on top of it but they are too heavy and were causing the top of the cube to sag, so I switched them out. I need to repaint the card catalogs. I painted one silver for my niece's wedding. We used it for seating place cards. I'm not sure what color I want to paint them now. Moving on around is my vintage mail sorting desk. This thing is a beast! I still want to make a skirt for it...someday! I have bins of old photos under the desk that need to be sorted and categorized. I started this a few summers ago and never finished. Maybe this summer. The shelves and top hold a variety of craft supplies. My two Raskog carts sit in front for now. You may remember the two Antonius organizers I picked up at Ikea when I took Miranda and Shahid to Orlando to the airport last Friday. They hold a lot of my Project Life and planner stuff and I have room to grow. These two Target Dollar Spot baskets fit nicely in the top of one of the carts and hold more Project Life stuff and notebooks. And finally, my sewing desk is now situated just inside the door to the right. Not ideal, but I don't sew too much and I can always move it to my dining room table if I need more room. I hemmed a few curtains recently and I was able to do it with no problem, so it will stay here for now. If you noticed the box underneath, this is what it is for. I wanted a designated spot to put items that I decide to get rid of. Over the past few weeks, I have purged several boxes and bags of stuff. Some went to donation and some to consignment. I plan to put it all in one box for now and when it gets full, I can sort it and get rid of it. I may try to find a couple of those stacking baskets later on, but for now this box will do. 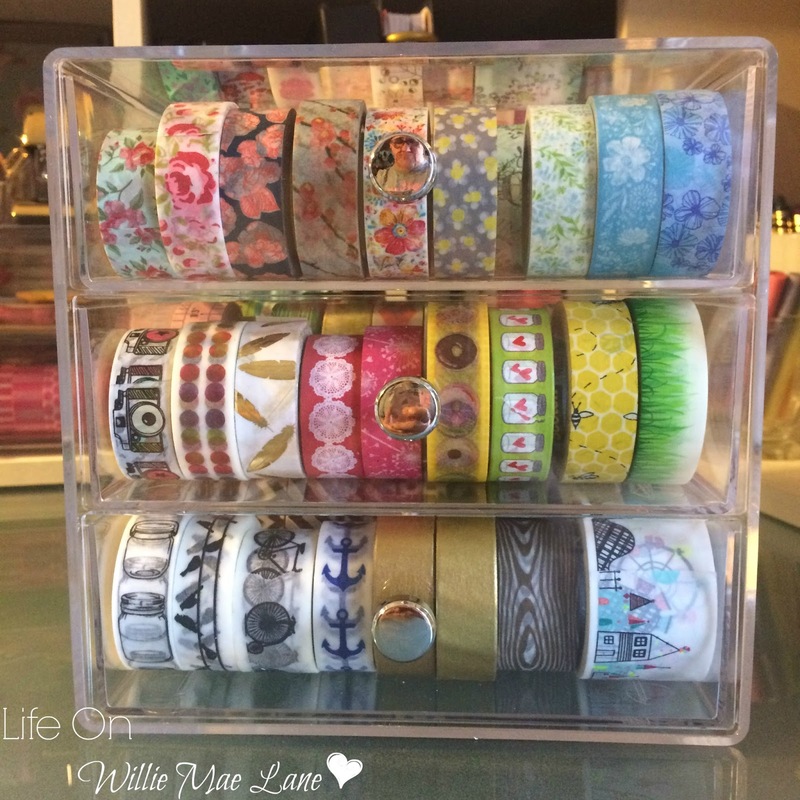 I have been organizing like crazy lately due to my new obsession of watching organization videos on Youtube. It started with just watching craft room organization but I have branched out and am watching organization videos for kitchens, bathrooms, cars and more. I have always loved to organize but watching these videos has made me love it even more. Anywho, while my craft room may look like a mess, it is actually very organized. I just have a lot of stuff in a very small space. I will be sharing a few of the things I have been organizing soon, along with one of my favorite thrifty finds ever, so stay tuned. If you made it to the end...bless you! I know I can be long winded! So, do you like to organize? If so, and you have any tips or tricks, leave a comment for me! The Beach, A Rooster, and A Wedding, Oh My!